You need to monitor your entire environment, even when you move some of it to the cloud. SolarWinds® Server & Application Monitor (SAM) can monitor your AWS® instances, Azure® VMs, and Microsoft Office® 365, enabling you to keep track of the health of all your applications and underlying infrastructure from one view. Choose between collecting AWS and Azure API information, or actually managing an AWS instance and Azure VMs as nodes for full application monitoring with SAM. Monitor your Microsoft Office 365 application side by side you on-premises applications. Monitoring SaaS applications and cloud workloads doesn't require a set of dedicated cloud monitoring tools. With SolarWinds® Server & Application Monitor or SAM, you can monitor applications and workloads on-premises, in remote locations, or hosted in the cloud within one integrated and powerful tool. SAM provides agent or agentless monitoring for Windows® and Linux® workloads. The agent is efficient, easy to manage, and can be deployed automatically. Monitor AWS® and Azure® and the underlying infrastructure via AWS services, CloudWatch® APIs, and Azure Monitor APIs. Built-in application templates include traditional on-premises enterprise applications as well as SaaS applications such Office® 365. Collect information specific to your cloud instance, such as status, region, and resource metrics. SAM automatically combines the API and agent-sourced metrics, providing a more complete picture of your workloads. View important data from EC2® instances, EBS® volumes, Azure VMs and Storage, alongside other servers and virtual machines that you are monitoring on-premises. Drag-and-drop any of these metrics into the PerfStack™ dashboard for visual correlation of your hybrid system. Use this data to make informed decisions about your workloads on-premises and in the cloud. And because SAM is part of the Orion® Platform, get even more detail on your cloud workloads, such as database wait times for SQL, RDS® and Aurora® using Database Performance Analyzer, and network path analysis with Network Performance Monitor. 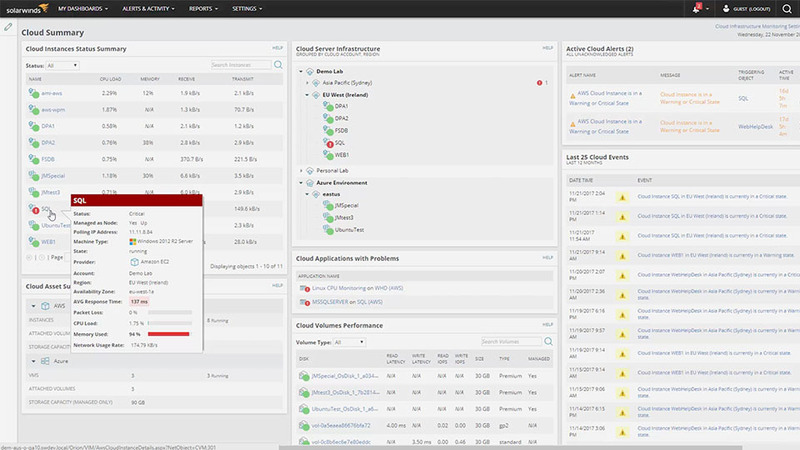 Take control of your hybrid workloads now with Server & Application Monitor.